How the Ankara bombing could hurt the war against ISIS. 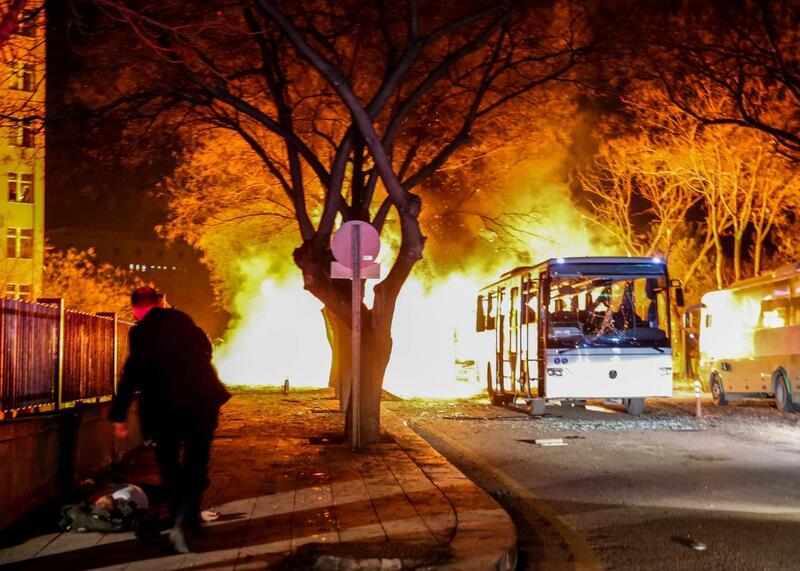 Turkish army service busses burn after an explosion on Wednesday in Ankara, Turkey. Turkish President Recep Tayyip Erdogan said that his government has evidence that a Syrian national linked to the main Kurdish militia fighting in Syria was behind the bombing that killed 28 people in Ankara on Wednesday. The People’s Protection Units, or YPG, however, denies responsibility for targeting the military convoy or any link to the named suspect, Salih Necar. Figuring out who’s behind a particular bombings is generally tricky business in Turkey, which has seen recent attacks by Kurdish militants, ISIS, and ultra-leftist groups. But Thursday’s allegations could have serious consequences for relations between Turkey and the United States and for the war in Syria. Turkey argues that the YPG is linked to the PKK, the banned Kurdish militant group that the government has been fighting for decades. Another attack that killed six soldiers in southeastern Turkey on Thursday was blamed on the PKK, hours after Turkey launched airstrikes targeting Kurdish separatist groups in Iraq. That’s a problem for the U.S., which views Kurdish fighters in both Iraq and Syria as the best hope for an effective ground force to fight ISIS and has been coordinating operations with the YPG. This has enraged the Turkish government, which accuses the U.S. of supporting terrorism with the moves. That argument came back with a vengeance after the Ankara bombing, with Turkish Prime Minister Ahmet Davutoglu warning the country’s NATO allies against legitimizing the group it says is responsible for the attack. “Just like al-Qaida or Daesh do not have seats at the table, the YPG, which is a terrorist organization, cannot have one,” he said on Thursday. Then there’s the Russia factor. Turkish-Russian relations have been at a low ebb since Turkish fighters shot down a Russian military plane on the Syrian-Turkish border in November. The Turkish government has recently accused Russia of war crimes for bombing Syrian hospitals and is seeking support for sending ground troops into Syria, as Russian-backed Syrian government troops near its territory. This would raise the alarming risk of direct military confrontation between Russia and Turkey. Turkey also accuses Russia of directly supporting the YPG. U.S. officials don’t believe this is the case, but at the very least they have some common interests. The YPG has taken advantage of the chaos caused by the Russian-backed Syrian military offensive on Aleppo to seize more territory from other opposition groups. The Kurdish gains, meanwhile, benefit Russia by driving a wedge between anti-Assad allies U.S. and Turkey. Russian supported including the Kurds in the now seemingly defunct peace talks in Geneva, putting the U.S. in the awkward position of excluding their allies for fear of offending Turkey. The U.S. doesn’t want to cut off the last viable nonregime anti-ISIS ground force in Syria. It also doesn’t want to completely alienate Turkey, a key ally and regional player. And it doesn’t want to simply hand victory on a silver platter to Vladimir Putin and Bashar al-Assad. At the moment, it’s not clear how it’s possible to do all three.